The House of Felix has not fallen. I have been there. I have seen it. But what did I see? In a pitch-black basement I experienced almost the whole gamut of séance phenomena from lights, to levitations, to apports and more. It was a great privilege to be able to take part, but what exactly those things were, I cannot say. 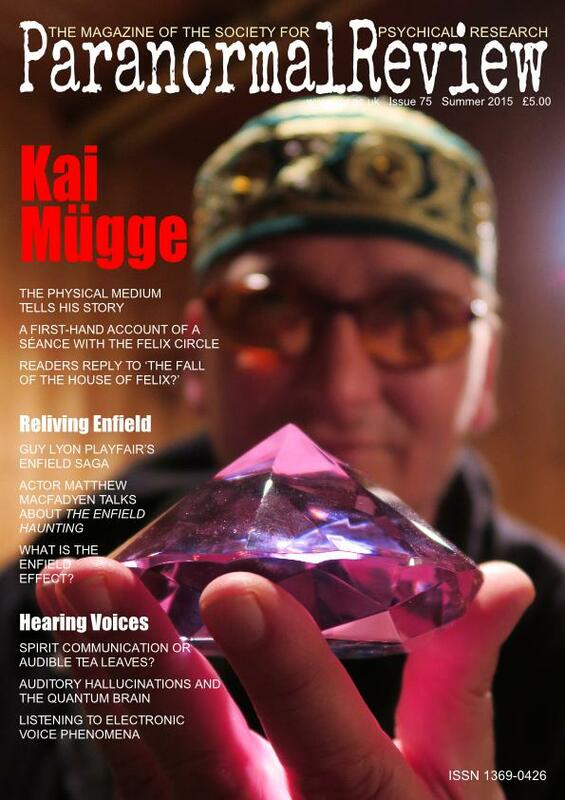 Did I mention that the mediumship of Kai Mügge is controversial? Since publishing the last issue – particularly Prof. Peter Mulacz’s article ‘The Fall of the House of Felix?’ – I have been inundated with emails on the subject and spent the recent joint Society for Psychical Research/Parapsychological Association Conference talking about little else. Both the articles and the reaction to them prompted me to wonder about the man at the centre of the storm. Putting aside all the claims and counter-claims, I wanted to hear his story and I wanted to give him the opportunity to tell it. On 23 June, I set out to meet him. But I did not just meet him: he also invited me to take part in one of his séances – an event that took place a week later on 30 June. You will find the results of those encounters printed here. The problem is that almost everything in parapsychology or psychical research is controversial. The Society’s new President, Prof. John Poynton asks if things are getting any better for the subject. The announcement from the previous President, Dr Richard Broughton, now Hon. Treasurer and a Vice-President, provides one answer to this question. I have three articles dealing in their own ways with the subject of hearing things. Ann Winsper, a PhD candidate at the University of Central Lancashire, introduces us to her research into Electronic Voice Phenomena (EVP) in an article based on her paper given at last year’s SPR Conference in York. She is now able to supply us with a link to her online application form and I would encourage everyone to take part. Dr James Paul Pandarakalam, a rehabilitation psychiatrist in the UK, considers the question of auditory hallucinations. Finally, Dr Peter McCue investigates some specific EVP samples from a case in Pennsylvania, USA. The recent TV mini-series The Enfield Haunting has revived an older controversy – that of the Enfield poltergeist case – and we are lucky to have Guy Lyon Playfair discussing the convoluted history of how, thirty-five years later, his book This House is Haunted made it to the small screen. Actor Matthew Macfadyen gives us his thoughts about playing Guy and the series in general. When I asked Guy what it was like being played by Macfadyen, he answered ‘well, the fact that he made off with Keira Knightley twice (Pride & Prejudice and Anna Karenina) was encouraging’. But of the series he said ‘I’ve only spotted one incident so far that actually happened as shown’. Nevertheless, the series has stirred up renewed interest in the SPR and John Fraser, a member of the SPR Council, asks what we should do about it. To top it all off, I have some great publicity stills from Sky Living to illustrate this section. ‘Recent Library Acquisitions’ makes its return to the Paranormal Review, although I have decided to rename it ‘Ex Libris’. Several of the titles will be familiar to readers from previous Paranormal Review articles. Callum Cooper is with us once again, reporting on the further exploits of the Centre for the Study of Anomalous Psychological Processes, on this occasion from the enchanting island of Crete. As usual, Brandon Hodge brings the curtain down, this time with the first of a two-part article on the hunt for the remains of Jonathan Koons’s spirit room. And also as usual, he has sent me several wonderful pictures to publish. New SPR President, Prof. John Poynton, asks whether the tide has turned for psychical research. Dr Leo Ruickbie talks to Kai Mügge about his life and work as a physical medium, including the question of investigation. After the table levitated, what happened next? Dr Leo Ruickbie details his recent experience of a séance with Kai Mügge and the Felix Circle. Ann R. Winsper asks whether electronic voice phenomena are genuine spirit communications or ‘audible tea leaves’. Dr Peter McCue details his analysis of audio files purporting to be communications from the spirits of the deceased. Dr James Paul Pandarakalam poses the question whether the source of auditory hallucinations lies beyond the material brain. Guy Lyon Playfair chronicles the history of the Enfield poltergeist from This House is Haunted to the TV drama The Enfield Haunting. Actor Matthew Macfadyen reveals what it was like to play Guy Lyon Playfair in the recent Sky Living mini-series The Enfield Haunting. SPR Council Member John Fraser considers the increased interest in the SPR and asks what should be done about it. What happened when the Centre for the Study of Anomalous Psychological Processes went to Crete? Callum Cooper tells all. SPR Librarian Karen Patel reveals what is new on the library shelves. Brandon Hodge searches for the remains of the famous spirit room of Jonathan Koons. Prof. Peter Mulacz responds to criticisms of his article in PR74.